With its Android-based Motorola Droid phone slated for availability tomorrow, Verizon Wireless isn't holding back. The carrier today announced the immediate availability of the LG Chocolate Touch, the first in the Chocolate phone family to feature a touch screen. The Chocolate Touch costs $80 (after a $50 online discount) when signing a new two-year service contract. 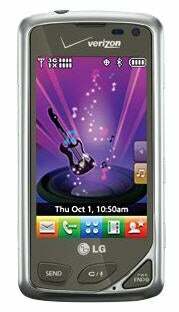 Its features include a 3-inch touch screen display; 3.2-megapixel camera with video recording; a full HTML Web browser; 1GB of internal memory upgradeable to 16GB through microSD cards; and 1x/EvDO Rev. O connectivity. Verizon's latest Chocolate phone might also double as music playback device, as its other features include a built-in FM radio with 12 presets; Integrated Song ID; a dedicated side key for easy access to favorite songs; a 3.5 mm headset jack; Dolby Mobile Equalizer; a Sound Level Controller; and a Music Player that works with MP3 as well as WMA, AAC, and AAC+ files. LG and Verizon also are touting the social networking features of Chocolate Touch, something we've seen in many phones announced recently, such as Sony Ericsson's Android-based Xperia X10. The Chocolate Touch is designed to offer easy access to Twitter, Facebook, MySpace, and other sites. Verizon has added a dedicated social networking shortcut key for uploading pictures and videos captured with the built-in camera/camcorder, which comes with a 1.6x zoom, five different resolutions, "facial makeover" for removing blemishes, a panorama mode, and a variety of other features for improved picture quality.